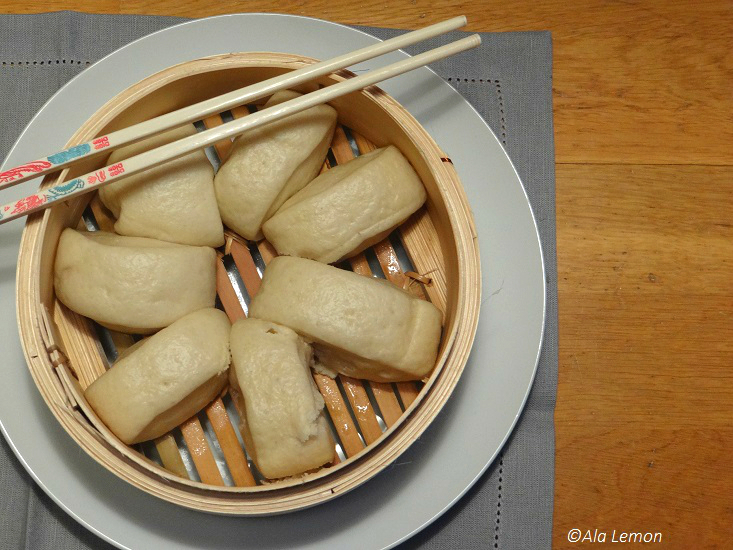 For today’s Sunday baking post, I decided to go into what is for me uncharted territory: Chinese cuisine. While I do enjoy eating Chinese, it’s not a cuisine I ever tried doing. I think the subtlety of flavours is kind of intimidating. To me, at least. But last night, I spent a while (OK, maybe that was a few hours) browsing Pinterest. Gosh, I love that site!! Anyway, I think this recipe was pinned by Rasa Malaysia and when I saw it, I figured it would make a great Sunday Baking post, while also continuing my culinary world tour. I admit I was a bit scared at first, but I figured since I get my way around doughs, there was no reason for this one to go horribly wrong. Also, at some point while reading Elaine’s recipe, she mentioned stuffed steamed buns, so I figured I’d give those a try too. My way. In a bowl, combine the water and half the sugar, and mix until the sugar is dissolved. Sprinkle the yeast over and let stand 5 to 10 minutes. In a large bowl, combine the flour and remaining sugar, then slowly add the yeast mixture and mix with a wooden spoon. Turn the dough onto a lightly floured surface and knead until your dough is smooth. I found the dough to be a little dense, but after kneading for 5-10 minutes, the dough did become smooth. Cover the bowl with Clingfilm and allow to rest for about an hour, or until doubled in size. Tip the dough onto a lightly floured surface, knock the air out and shape the dough into a log, approximately 2,5cm/1 in. in diameter. Cut the dough into 12 pieces, or several bite-sized pieces if you prefer. 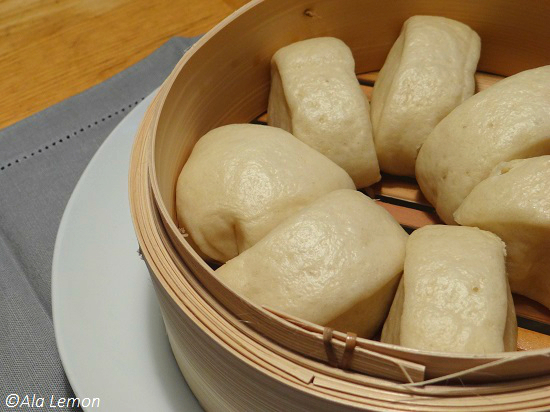 Brush some vegetable oil on the bottom of each bun and place them in a bamboo steamer. Fill the bottom of a wok or large pan with cold water and place the steamers over, making sure the steamers do not touch the water, and place the pan over high heat. Steam for 15 to 20 minutes after the water starts boiling. Turn off the fire and wait for around 5 minutes before opening the lid. Peel, core and chop your apple into small pieces. Place into a small pan with the cinnamon and maple syrup. Cook over medium-high heat until your apples are caramelised but not mushy, and allow to cool. Take a piece of dough and shape into a disk, roughly larger than the palm of your hand. 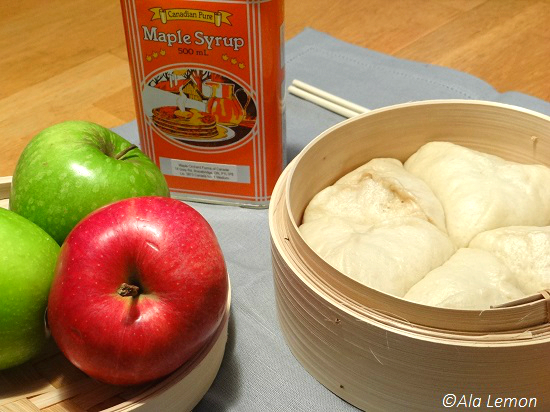 Place about 1 tablespoon of apple in the centre and pinch the parcel closed any way you like. (I tried using a T-shape pinch, but I think I had way too much filling and it didn’t turn out too nice). Brush vegetable oil on the bottom of each parcel and steam as with normal buns. 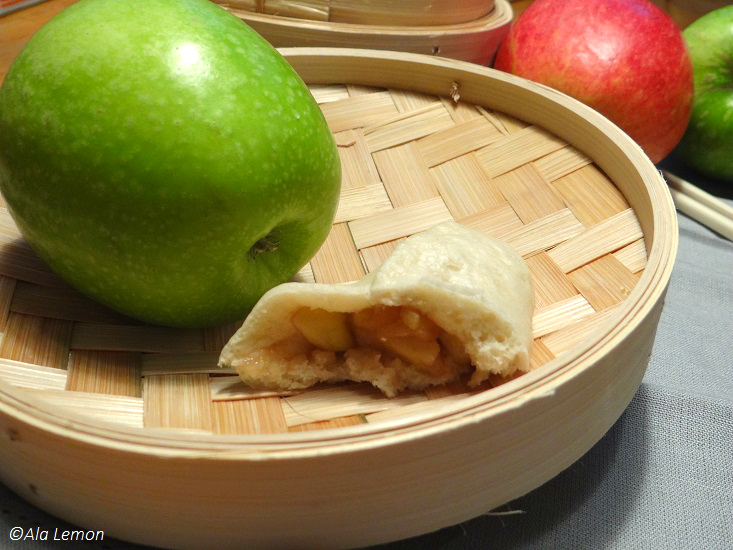 I think I’ve tasted the savoury version of these buns but what a lovely idea to stuff them with apple! I must try them. I really enjoy the culinary world tour you are taking us around, bravo and keep on!